Whether you want to lose weight, improve your diet or mood, or just maintain a healthy lifestyle, there’s one thing we can all agree on: it’s not easy. Between a jam-packed schedule, a long list of responsibilities, and having to break habits you probably established eons ago, making any kind of lifestyle change can be a long process full of obstacles. Arming yourself with the right set of tools and resources is the best thing you can do to make the process a bit easier. One of my personal favorites? A food and mood journal. 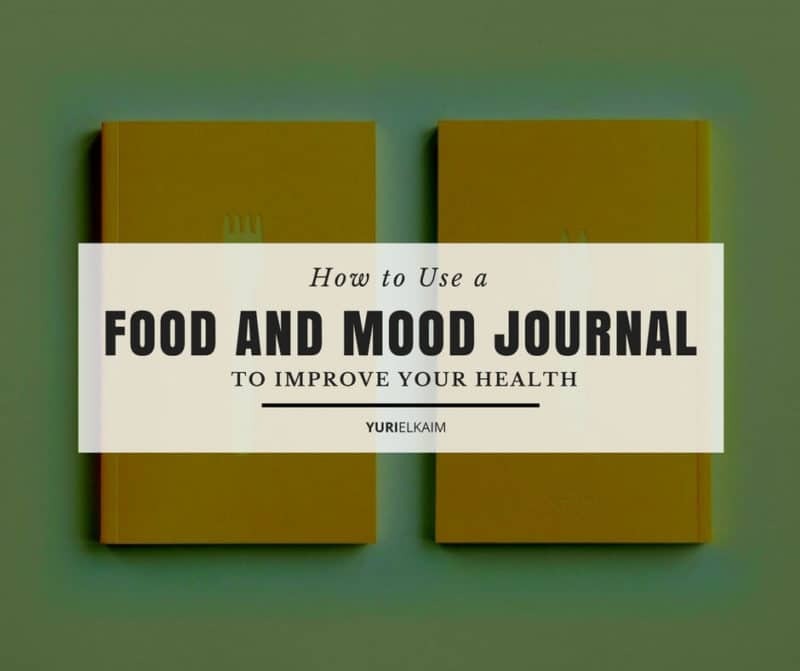 Why a Food and Mood Journal? A food journal is pretty much what you would expect. It’s a tool for tracking what you eat and when to help lead you towards success with meeting your goals. And mood journals can help you track how you feel so that you can work on handling your emotions better. Food journals are most commonly used as a powerful tool for weight loss. In fact, a study in the American Journal of Preventive Medicine found that participants who kept a food journal lost twice as much weight as those who didn’t (1). Mood journals, on the other hand, are often used as a tool for treating problems like depression, or simply as a way to learn more about yourself and your emotions. Paired together, they can provide new insight into how and why you might be making some food choices, plus how your emotions could be playing a role. But food and mood journals aren’t just for helping you shed pounds or writing about how you feel. In fact, there are plenty of other benefits that come with keeping a food journal. They allow you to identify negative habits and show how they make you feel to help you break the cycle. Food journals can help identify intolerances to certain foods. Recording what you’re eating can help pinpoint foods that might be causing negative symptoms, like gas or bloating. Tracking your mood can help you reflect on how certain events might trigger changes in your emotions, allowing you to understand your inner processes even better. Food journals hold you accountable, which can help keep you on track regardless of what your nutrition goals are. Think about it: you’re much less likely to veer way off course in your diet if you know you’re going to have to write it down. They can be a good tool for expressing yourself and coping with your personal feelings. They can ensure that you’re meeting your nutritional needs and getting a balanced diet. Minor nutritional deficiencies are easy to catch when you have a detailed log of what you’ve been eating. They can identify potential triggers that are keeping you from losing weight, making changes, and reaching your goals. The bottom line is that keeping a food and mood journal can be an awesome tool to help you take a closer look at your relationship with food, determine how certain things make you feel, and figure out what steps you can take to reach your goals. If you’re like me, there are plenty of times when I rush out the door with nothing but my phone, wallet, and keys. This can be a problem if you are keeping a hand-written food and mood journal. If I grab a salad while I’m out, down a green juice smoothie, then munch on a snack somewhere in between, by the time I get home, it can be pretty challenging to remember everything and write an accurate record that will actually account for everything I consumed. Plus, in this day and age, carrying around a pen and paper to keep a log can be unrealistic for some people. If you’ve ever started keeping a food journal only to give up after a day or two, it could be because you haven’t found the right food journal fit. Though many people find success recording their food and mood journals using nothing but good old-fashioned pen and paper, journaling apps can be a good alternative to helping you stay on track when you’re on the go. Not only that, but many are equipped with special features, like nutrient trackers, that can give you a whole new insight into what you’re really eating. This free app is one of the more popular calorie counters available. It has a huge database, so it’s possible to enter pretty much anything you can think of into your food diary. It also provides comprehensive nutrient information and allows you to track your exercise as well. It even has a section to add notes for the day, allowing you to record your moods and measure how you’re feeling. Plus, joining this app gives you access to their online community so you can get support from others with similar nutrition goals all around the globe. On the flip side, some features (like tracking the most minute micronutrients) aren’t included in the free version. It also requires a wireless signal for full functionality and access to the entire food database, which isn’t always completely convenient. Fooducate differs from other nutrition trackers because it’s centered around the premise of educating the user rather than just allowing for the recording of data. It’s also one of the few food journal apps with a mood tracker built right in. An account with Fooducate comes with daily tips, a newsletter, and articles on a variety of nutrition topics. Each food in the database is also assigned a grade with an in-depth explanation detailing why it may or may not be a good choice for you. Finally, it offers alternatives to foods you might be interested in that have been given less-than-stellar grades. Fooducate is a lot different than other apps, though, as it doesn’t allow you to track macronutrients as thoroughly and it doesn’t have the same wide range of food options available in its database. This comprehensive app lets you track your intake and record any symptoms that might come along with it. It also tracks the time, so you can pinpoint the cause of any changes even more accurately. In addition to intake, you have the option to record your energy levels, sleep quality, and even bowel movements as well as a notes section to write down your mood. This is a very thorough app and is affordable at just $2.99. The big downside is that the nutrient database isn’t as complete as it is with other apps, so recording your intake might take a little extra effort on your end. The truth is that there is so much more to consider in your food diary than just calories. 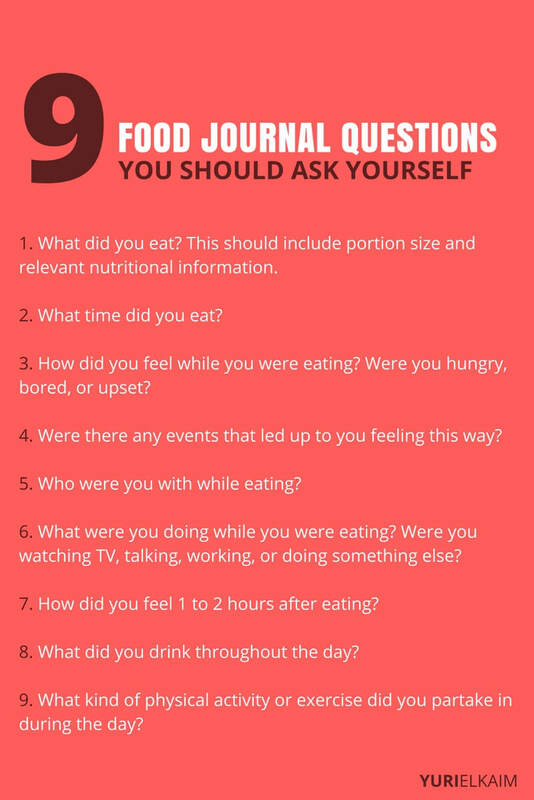 To take advantage of the benefits of your food journal, you have to ask the right questions so that you can get the full picture when it comes to your diet and mood. Not only should you record what you eat, but you should also take note of how you feel, both physically and mentally. This can help pinpoint not just what you’re eating but why you’re eating it and also how eating certain foods makes you feel. What did you eat? This should include portion size and relevant nutritional information. How did you feel while you were eating? Were you hungry, bored, or upset? Were there any events that led up to you feeling this way? Who were you with while eating? What were you doing while you were eating? Were you watching TV, talking, working, or doing something else? How did you feel 1 to 2 hours after eating? What did you drink throughout the day? What kind of physical activity or exercise did you partake in during the day? It may seem like a lot of information, but it can all be recorded quickly and easily. Best of all, keeping a detailed food and mood journal can really help maximize the benefits and push you towards reaching your goals. If you’re looking for a thorough daily food journal template, here’s a great one courtesy of Two Sisters Gluten Free. Print out a week or two at a time and keep it somewhere where you can easily access it. If you need to, you can text yourself reminders of what you eat or drink throughout the day and transfer it to your written food diary later on. After you’ve completed about a week of your food and mood journal is when the fun really starts. You’ve done the hard work of compiling all that data – now it’s time to analyze it and decide what steps you need to take next to gain traction towards reaching your goals. Consider how certain foods might have made you feel, if you are overeating in certain social situations, or if you’re actually eating only when you’re hungry. You can also use the information you collected to look at which moods make you crave certain types of foods or if there are specific times during the day that you are more prone to snacking. Using your findings, you’re all set to make some healthy changes and take a step in the right direction. Equipped with the power of your food and mood journal, you have everything you need to reach your goals. Want a quick jumpstart on feeling leaner, lighter, and more energized? “Detoxify” your body in 24 hours with my FREE 1-day plan of mouthwatering “cleansing” meals. You’ll banish bloat, cut sugar cravings, and feel back-on-track in just one day. Download the 1-Day Detox Plan now by clicking the banner below!